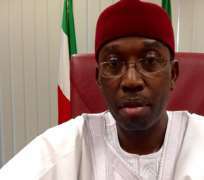 Aides to the Delta State Governor, Senator (Dr) Ifeanyi Okowa are currently rendering account of stewardships to Deltans in the last one year. Addressing journalists Monday, at the Unity Hall, Government House, the Secretary to the State Government (SSG), Mr. Festus Ovie Agas said the government through his office has re-energized and strengthened the machinery of governance, “acting as the administrative hub and clearing house for effective co-ordination and implementation of the ensuing policies and programmes of government”. According to him, “I have so far continued to carry out the obligations entrusted to the office by ensuring effective and efficient realization of the goals and objectives of the state government”. He noted that his office issues from time to time, notices of policy decisions on programmes of government for the purposes of information dissemination, programme implementation and mobilizing the people for participation in government programmes and activities. Also, the Commissioner for Agriculture and Natural Resources, Mr. Austin Chikezie said the Oil Palm Development Programme of the state government was developed to assist oil palm farmers to increase their plantations, “through this programme, 220, 000 improved oil palm seedlings are being raised for distribution to farmers and to cultivate and met to empower 250 oil palm farmers and create 100 regular jobs and 300 seasonal jobs”. His words: “this administration is determined to encourage all farmers in the state to access available agricultural credits due to farmers in the nation”. In another development, the Commissioner for Urban Renewal, Mr. Oghenekaro Ilolo, noted that his ministry was saddled with the responsibility of intervening in the area of roads and drainage construction, provision of streetlights, beautification of towns and cities through landscaping and tree planting. He said, “In August 2016, the state government through the ministry signed a Memorandum of Understanding (MoU) with Sparkwest Steel Construction Company Limited, Lekki, Lagos for the construction of Telecommunication Masts, Gantries, with street directional signs, streetlights as well as laying of fibre optic cable all over the state”. He stressed that the MoU is expected to improve communication as well as infrastructure development within the state. Similarly, the Commissioner for Housing, Mr. Ogeah Ajiri Joseph, revealed that the Abuja 10 floor Tower which served multipurpose services has been completed and already in use, “the Tower has been concession to a property manager”. He also disclosed that the state government via his ministry has concluded plans to erect a Central Secretariat which would be located amidst the already two existing secretariats that would house the 28 MDAs that are on rent.